Women's health is the branch of medicine that focuses on the treatment and diagnosis of diseases and conditions that affect a woman's physical and emotional well-being. Chances are you’ve heard of Erlanger as the birthing location of choice for more area women than any other hospital. 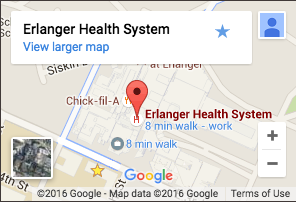 What you may not know is that this is just one way Erlanger stands apart in serving women’s unique medical needs. We offer much more because women’s health encompasses much more than childbirth – and your care needs are not the same as a man’s. Women respond differently to some treatments, face a range of different medical conditions, and display unique symptoms for heart disease. That’s why Erlanger offers a complete line of services to address women's health care needs from the beginning of your reproductive years through older adulthood. Childbirth / Obstetrics – One of Tennessee’s first “Baby-Friendly” hospitals is also the first choice for more childbirths than any medical facility in the region. General Gynecological Services – The region’s only academic OB/GYN program provides a full range of general gynecologic services from yearly examinations and screenings to highly-specialized, minimally-invasive procedures. Female Urology / Urogynecology – We offer fellowship-trained expertise in the evaluation and treatment of pelvic floor disorders including incontinence and pelvic organ prolapse. Women’s Cardiology – Erlanger is the region’s first provider with a distinct focus on women’s unique cardiovascular system and heart-health needs. Women’s Cancer Services / Oncology – From the region’s only board-certified genetics counselors to 3-D Tomosynthesis mamography, Erlanger offers more specialized ways to diagnose and treat gynecologic and breast cancers.